Happy Friday! 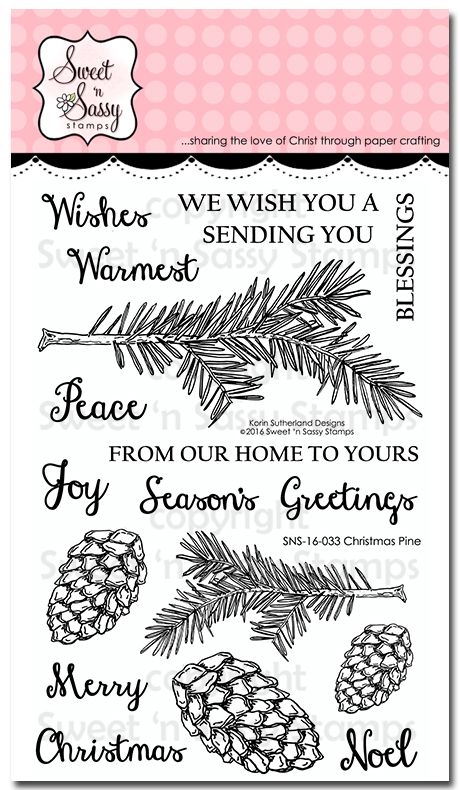 Today we will be highlighting several new Christmas stamp sets from Sweet ‘n Sassy Stamps (SNSS) on the SNSS Blog and I am sharing a card with the new Christmas Pine Clear Stamp Set designed by Korin Sutherland. 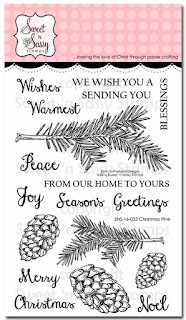 I love the different branches and pine cones in the SNSS Christmas Pine Clear Stamp Set as well as the sentiments- perfect for both Christmas, Winter and Masculine cards. I incorporated the Can You Case It#CYCI136 Sketch along with the Simon Says Monday " StAMPtember® Stamp It” Challenge into the design. I hope you will take the time to visit the SNSS Blog as well as the other challenge sites- fabulous inspiration from all! Ink the large pine branch image from SNSS Christmas Pine Clear Stamp Set using Distress Inks (I used Peeled Paint and Forest Moss) and stamp onto a piece of vanilla cardstock. Continue to re-ink the stamp and stamp onto the vanilla cardstock to build up layers of the needles. Color the branch portion of the image with the Gathered Twigs Distress Marker and use a water brush to soften the ink on the branches. Stamp the sentiment from the SNSS Christmas Pine Clear Stamp Set with Festive Berry Distress Ink, distress the edges of the panel with a distressing tool and use a zigzag stitch to adhere to a piece of dark brown cardstock and distress the edges. Distress the edges of a piece of plaid designer paper and adhere to a piece of dark brown cardstock with the zigzag stitch (distressing the edges of the brown cardstock as well). Emboss a piece of vanilla cardstock with the Tim Holtz® Poinsettia Knit embossing folder, trim and adhere to the cherry cardstock panel, trim and mount onto the dark brown card base. Add the designer paper panel on an angle (per the sketch) and mount the pine needle focal image panel with dimensional foam. Stamp the pine cones from the SNSS Christmas Pine Clear Stamp Set with Gathered Twigs Distress Ink onto vanilla cardstock, color with a water brush with ink from the Gathered Twigs and Walnut Stain Distress Ink pads, add a bit of dark brown marker for shadows and create a bit of “snow” with the Sharpie® Extra Fine White Paint Pen. Use a clear glitter pen over the entire surface of each pine cone (hard to see in the photo). Fussy cut the pine cones and add to the card front with dimensional foam. Finish off the card with the dark brown triple satin ribbon bow and sequins. Thanks for taking the time to visit- hugs and I hope you have a blessed week, my friends!